seem that all four villages were built on eyots or islands, small areas of drier land a few feet higher than the marshier land that surrounded them. The damp oak woods of this part of the Thames valley were not particularly attractive to the Saxon farmers and it is more than likely that these sites were not used until the more favourable areas were fully settled. 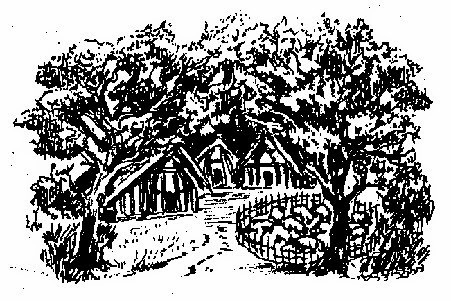 From the suffix 'ton' we get our modern word, town, but in Saxon times this merely meant a village and the first Eton, situated somewhere in the area of the modern town, would have consisted only of a small collection of homesteads and a chief 'shall surrounded by a palisade. Beyond the 'ton' the Saxons cleared the land for their large arable fields which they worked as a community. By the streams, the land too wet for ploughing was left as meadow for hay, and beyond the fields and meadows was the common or waste where the animals were pastured in the summer. Here too were the woods not yet cleared, a very important part of the economy of the settlement - as a source of building material, fuel and food in the autumn for the swine. Sometime after the establishment of this first 'island village', perhaps only a generation or so or maybe a few hundred years, a fresh part of the woods or waste was cleared and a group of buildings put up where the dairy animals could be sheltered and probably butter and cheese made. In modern terms it might be described as the village dairy farm, though in those days the animals were likely to have been both sheep and cows, for sheep provided both wool and milk and could live on poorer pasture. In the words of the Saxons this was the village 'wick' - Eton Wick had been born.